The VT365 is a Navistar engine used in big trucks and Ford vehicles in the U.S. Its 6.0 liter displacement was even coined as the Powerstroke from 2003 to the 2010 year. This block has a fully working hydraulic injection system. It is one of the biggest V8 diesel assemblies that regular consumers can find. 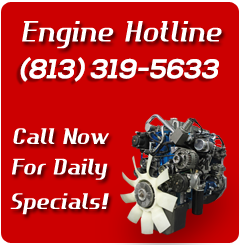 You can buy a used VT365 engine and save big here online. You will get 325 horsepower upon ownership of this V8. The block stamp carries the name of the motor, but this is really the CID rating. The 365 cubic inches is fixed into the 32-valve design. The International Xtreme trucks (XT) and MXT trucks did showcase the power of this assembly nationwide. As an owner, there are very few VT365 motor problems to worry about. The block might stall due to misuse or another problem. Good maintenance will ensure the longest life span possible for the used Navistar diesel engines you can order at GDE. You never buy alone when you order on this website. Not only are you informed during your research, we follow through with customer service. This is the type of relationship that we prefer to have. GotDieselEngines.com is a professional company. Our staff is trained. We have a national phone number. We are excited to supply a warranty plan at the point of sale to consumers. This all but guarantees you will never have an issue with the 6.0 liter block. If something fails because it is an OEM problem, we are more than happy to step in and remedy it. You might have bought one or two motors in your time. This might be your first go round. Navistar/International is a great company. What gets placed inside of your truck is important. First, we only find blocks that feature a low count in mileage. This does keep the condition better and limits warranty claims. Even the best steam cleaning routine will never remove some of the surface rust. You should know that before you order. The gaskets go through a pressurized test. We know if something is leaking and we validate what our suppliers tell us. Power up your diesel automobile with a full replacement product. GDE works with companies that pull out builds from big and small trucks. Most of the agencies are junk yards that are in all 50 states. We will give you a price quote first. Please look at this data and decide if you want to order. Call us on our toll-free line to complete the process. At this point, we can get to know you and arrange your shipment.